You can now launch OpenExchange apps directly from Studio. Cool. I used to keep a bunch of these apps on my desktop and had to search for the right one each time. Now, I just go to the Studio Welcome View, and the left-hand menu lists all the apps that can be launched with a single click. There’s also a link to the OpenExchange App Store right there. And, if you use the new Menu Maker app, you can even customise the list of apps in the Welcome view. Studio 2011 and 2014 use the same project and package formats. So the transition when you upgrade will be smoother than between 2009 and 2011 (where projects are only compatible if you select the right option in advance). If you work with Trados 2007 buffs who want your TM returned with field values and all, you can now export your studio TM to TMX and carry over your text fields and attributes. To do this, select “Export to Workbench-optimized TMX format for use in Trados 2007” in the TMX export wizard. You can now do a quick analysis on a new file by simply opening it in Studio (Welcome View>Translate Single Document). Studio saves it in the background so that batch tasks are immediately available. And while I’m on the subject of analysing files, you can now report locked segments separately in the analysis. There are three improvements in this area. If you work with those terrible agencies that don’t pay you to translate 100% matches, you can now lock them in the pre-translation task to make sure you don’t go near them. It’s not just agencies that benefit from this. I’ve just set up a project that has 75,000 words in 100% matches from a previous job I did. By locking these segments during “pre-translate” I can just concentrate on the remaining 5,000 words that I’ve got left to do. In the Editor View, you can now set the status of a group of adjacent segments as locked or unlocked even if they have a mixture of locked/unlocked segments inside them. Select the segments and toggle between the two using Ctrl+L. When you’re translating, after confirming a segment, Studio now skips locked segments and goes to the next unlocked segment. Just a minor detail, but it speeds up your work! The display filter is located under the Review Tab in the ribbon. It has been expanded in Studio 2014 and the old “duplicate” filter has been replaced with a “repetitions” filter. This is excellent for checking that auto-propagation has been performed correctly (yes, AP does get hiccups sometimes). If you’re using the “case sensitive” options, right now Studio can’t cope with a search that starts with an uppercase letter. It gets switched to lowercase. The workaround until this is corrected is to type any letter, then your real search in uppercase and then delete the prefixed letter. If you’re translating a segment you can easily switch the focus to the filter display by clicking Ctrl+F6. Reset the filter by using Ctrl+Alt+F6. Those two shortcuts are brilliant! The comments feature has at last been brought back after disappearing a year ago. And it has returned bigger and better! You can choose to “Retain Studio target comments in target file” under File Tab>Options>File Types>Microsoft Word 2007-2013>Common. 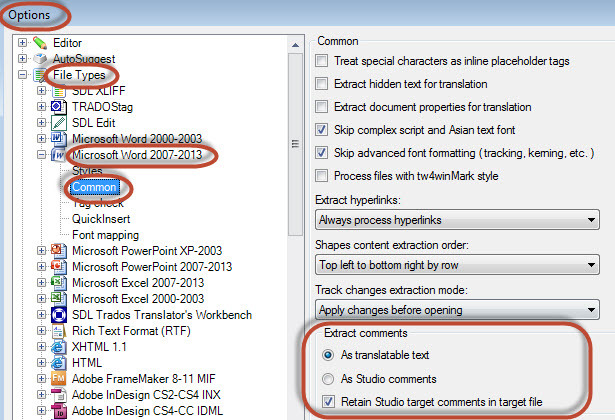 Don’t miss the useful feature immediately above this option, where you can choose whether to import Word comments into Studio as translatable text or as Studio comments. Nice! Batch processing. The progress bar no longer falls asleep at 95% when I add a file to a project. And a different sort of speed improvement: To access general Studio settings, simply press Alt+F followed by T. Couldn’t be faster! In addition to the old feature of merging files together when you create a new project, Studio 2014 now lets you merge any files together on the fly in a virtual way, with all the advantages that this brings in terms of auto-propagation, spell-checking, etc. The other day I wanted to change something in a set of files I’d translated, but I couldn’t remember which file it was in. I opened them all with QuickMerge and found it immediately with Ctrl+F. How do you perform QuickMerge? Simply select a group of files in the target file view and press Enter to open them as a single “virtually” merged file. If you select a group of adjacent files using the shift key, Studio will merge them in the order they appear in the files list. To specify the order the files are merged in, select each file from the list using Ctrl + left mouse click and Studio will open them in the order that you selected them. If you have a lot of files and want to shuffle them around first, then programs such as Bulk Rename will let you re-order your file list, prefix an incremental number to each filename, [translate in Studio with QuickMerge] and then remove the prefix, as explained in more detail by Paul Filkin in his blog post on Advanced Renamer and … QuickMerge. To open several files at a time, unmerged and under separate tabs, just select the files and click Ctrl+Enter. Segment numbering restarts at the beginning of each file, so if you’re searching, say, for segment 20 using GoTo (Ctrl+G), you can jump between the different no. 20s by using Previous and Next (Ctrl+J). In the Editor view you can easily see where one file ends and the next one starts in the navigation pane on the left. Click a file name there if you want to jump to the same file in your translation. One last point about QuickMerge: you can’t use it to merge several files for external review. They’re only “virtually” merged after all, and would fall apart on their way over to Word. I was going to add a final comment about the new Studio 2014 Ribbon for advanced users, but there’s such a lot to say that I’ll save it for another post. Don’t miss it! This entry was posted in 2. Beyond the Basics, SDL Trados Studio and tagged new features, SDL, Studio, Studio 2014, Trados. Bookmark the permalink. Brilliant tips here Emma… really brilliant. I think your explanation of Quickmerge answers any question I think think I’ve ever had! What’s more you taught me the Ctrl+Enter trick to open multiple files unmerged… I had no idea! Thank you for your kind words, Paul. Teaching a new trick to a Studio buff like you has made my day! Great post Emma, with a lot of practical tips. The addition of the Filter indication in the status bar is fantastic. I sometimes tend to forget to clear the filter when I’m done, so now I just have to take a quick peak to know where things stand. The QuickMerge and Auto Concordance Search are probably the most important features in therms of functionality, but Studio 2014 improvements go well beyond that. It is the little attention to details such the filter status indication, OpenExchange apps integration, Autosave, better Drag and Drop, better segment locking mechanism (and reporting) that significantly improve the user experience and makes you feel like you are in control of your project and your tool instead the other way around. One more thing to note in that regard is the Undo list. Although it is not new to Studio 2014, the replacement of the Undo and Redo icons on the Quick Access Bar increases their viability and the fact that you can click the down arrow next to the Undo icon to display a list of recent changed and select with state you want to specifically revert back to. Very nice. Thanks for your comments, Shai. I haven’t really used the dropdown history of undos. I’ll have to try it out, it looks useful. Hi Emma, nice tips and tricks, thank you!! I can’t wait to try on QuickMerge. Do you mind telling me if QuickMerge is only “virtual”, or is the merged file saved somewhere in the project folder and I can send the merged file to the editor for review? 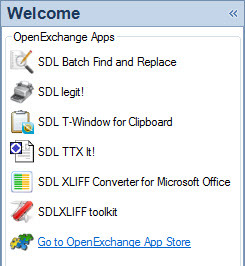 Hi Chun-yi, QuickMerge is virtual, so you can’t send the merged sdlxliff for review. Of course, if your editor has got Studio 2014 he or she can open all the files merged on their machine. Otherwise, the old feature of merging files when setting up a project is the best solution if you want a single sdlxliff file. thanks Emma! your post has been extremely useful. don’t ask me why, but I just couldn’t find the Display Filter. what a mystery! there it was, thanks again. I missed your comment earlier, Hannu, so I apologise for the delayed reply. I actually discovered a bug (and reported it to Paul). The cursor moves to the field ONLY IF Studio window is wide enough for the field to be displayed. I (and probably many others) don’t allow Studio to hog all screen space so that’s why it didn’t work for me. That’s very interesting, Hannu. Thanks for reporting back. I’ve just tested it by shrinking my screen and you’re right, it doesn’t work at all! I also tried Alt R Z (which does the same thing) and that doesn’t work either. One way of overcoming this would be make the ribbon customisable. Then we could move the display filter towards the left of the ribbon, and the shortcut would work with all displays. While we’re on the subject of customisation, I’d like to be able to customise the Quick Access toolbar at the top, too. Did Trados Studio 2014 finally give up chopping off any untranslatable token when it appears at the end or at the beginning of the source segment? I’m not affected by leading and trailing tags being left outside segments, but I’m aware that it does happen, particularly in certain languages. As far as I know this hasn’t been improved in Studio 2014. As you say, the workaround is to work in “all content” view and cut and paste the errant tags. Thanks Emma for you reply. Unless I missed something, the “All contents” workaround does not consistently work. There are of course verification issues and in many cases it will shift all the segments in the whole file and put a terrible mess. This issue is very annoying for instance with product names, which can appear ten times or more in a file with different grammatical functions, so you can’t even add an article even if you can translate the product name elsewhere. You can’t use a product name without an article in French, and even if you could there are constant issues with adjectives, genitives etc. I’m sure you’ll understand why I removed your next comment. My blog isn’t the right place for letting off steam. I hope you get a lively discussion going on the forum where you copied your comment. In addition to the old feature of merging files together when you create a new project, Studio 2014 now lets you merge any files together on the fly in a virtual way, with all the advantages that this brings in terms of auto-propagation, spell-checking, etc. Great news! IIRC I could not unmerge files when I tried the merging option in TS 2011… Now Quickmerge seems to give the equivalent of one of the features found in OmegaT which I was missing most in Trados Studio. If it already works flawlessly in TS 2014 then it will definitively be worth upgrading, [link and rest of comment removed]. Still I would take the free trial if I was sure it won’t disturb my current 2011 installation. Is there no risk? Alexandre, I think you’re using my blog to advertise OmegaT more than anything. I can’t see how linking to a thread on ProZ on Studio bugs is relevant to this blog post, which is why I’ve removed it. There are always risks when downloading new software. You need to make that decision yourself. I was just asking you about the risks because there are so much passionate contributions, e. g. in the link I provided, that it is getting very difficult to sort out what is really relevant. I would like to take this opportunity to recall the fact that Trados Studio is an application intended for a professional user base. Moreover, in the case of freelance translators, those users often have stringent deadlines to deliver their work, and at the first issue they may not only lose one client or more, but also get disastrous feedback on the websites they rely upon. This can of course seriously compromise the rest of a translator’s carrier. That’s why I don’t happily mess around with my professional software base. Concerning the other translation application mentioned, I apologize for having named it a second time in your blog. It is OSS, and does not make any advertising. Congratulations and thanks again for the continued pertinent and helpful information you provide about Trados Studio. You can only quick merge files if they’re in a project. Create a project, add the files, select all 3 and click “open for translation”. If that doesn’t work, check your MIF files. Studio supports versions 8-11. I’m not sure if it supports older ones, or the latest release, which is 12. After opening in Quick Merge and changing a segment in a file, Trados won’t change the following 100% similar segments automatically – neither in the same file or in the other files shown in the merge. Why is this? Perhaps my settings are incorrect? Have you got your settings right in File>Options>Editor>Auto-propagation? I’ve got the first 3 boxes enabled (with minimum match value 100%) and “Prompt user: never”. That works for me. Indeed that seems to be the correct settings, thank you. However, it still does not work – I’m supposed to proof-read these files and make necessary changes, but changes I make to a segment, will not propagate in the following 100% matching segments, neither in the same file nor in the others… 😦 Most segments are marked “CM”, I don’t know if that’s problematic or not. I’m not sure what to suggest in that case, Robert. CM segments should also autopropagate without a problem. Sorry I can’t be of any more help. Studio does not propagate any confirmed segments in Review mode if Track Changes is turned on. Turn it off and propagation will work again. At least that’s what I experienced. At last I found out that the auto-propagation feature in QuickMerge will only work on a limited number of files – in my case 7 merged files, not more. Good to know.